This is your invitation to pursue your greatest ambition. Every one of our programs is led by expert faculty who recognize talent and will connect you to opportunities you can’t find anywhere else. Get a deeper understanding of the NAU experience by exploring the college that has your major. College of Arts and Letters To activate the College of Arts and Letters tab, press your spacebar. Join a tight-knit community that feels like a small liberal arts college with all the perks of a globally connected university. Set in a culturally vibrant mountain town, our campus and creative programs will launch you on a career path you’ll love to live—in the arts, business, education, languages, or public service. College of Education To activate the College of Education tab, press your spacebar. In the only nationally accredited teacher education program in Arizona, you’ll engage in demanding, hands-on coursework, performance assessments, and innovative teaching methods. Mentored by expert faculty, you’ll graduate as a competent professional, prepared to lead in the classroom and bring out the best in your students. College of Engineering, Informatics, and Applied Sciences To activate the College of Engineering, Informatics, and Applied Sciences tab, press your spacebar. 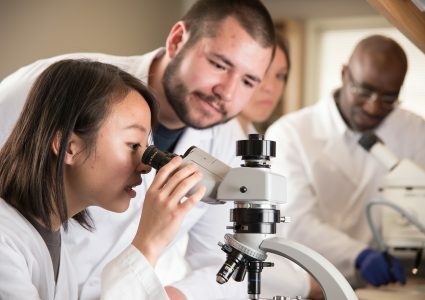 Join a diverse community of scholars who integrate fast-growing scientific knowledge with engineering, computer technology, and environmental and biological informatics. Here, as part of the next generation of scientists, you will conduct meaningful research and apply technical innovation to create a better world. College of the Environment, Forestry, and Natural Sciences To activate the College of the Environment, Forestry, and Natural Sciences tab, press your spacebar. Partner with esteemed faculty to meet today’s challenges and uncover tomorrow’s solutions. Surrounded by one of the most ecologically diverse natural labs in the world, you can perform revolutionary research in 30 high-tech labs and institutes and develop an entrepreneurial approach to discovery. College of Health and Human Services To activate the College of Health and Human Services tab, press your spacebar. Practice in state-of-the-art simulation environments and clinics statewide. You’ll develop skills to improve the health of those in your own community—and beyond. In evidence-based programs, you’ll collaborate with faculty through research that sparks healthcare innovation and encourages compassionate service. College of Social and Behavioral Sciences To activate the College of Social and Behavioral Sciences tab, press your spacebar. Tackle contemporary issues and conduct boundary-crossing research focusing on the scientific study of human behavior, justice, and culture. From archaeological digs to virtual reality creations, you’ll join with faculty and peers to build resilient, sustainable communities. Graduate College To activate the Graduate College tab, press your spacebar. Engage in interdisciplinary scholarship and research in our culturally and ecologically rich setting. Build a lifelong network with exceptional mentors and professional partners and change the way we see the world. Choose from more than 100 graduate degrees and certificates in a diverse range of disciplines. Honors College To activate the Honors College tab, press your spacebar. Our accomplished faculty lead small, interactive classes for a deeply rewarding educational experience. Here, you can join a diverse living and learning community, paint with a master in the Grand Canyon, restore a river delta, and cultivate citizenship through serving local and global communities. The W. A. Franke College of Business To activate the The W. A. Franke College of Business tab, press your spacebar. 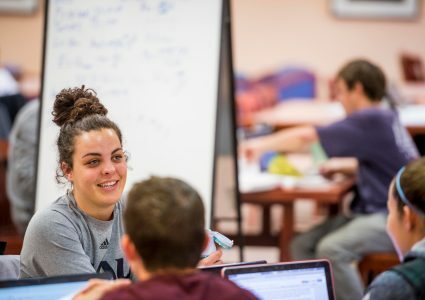 Our students connect with global business leaders such as Warren Buffett, manage financial portfolios, and present business plans to venture capitalists. Dedicated, approachable faculty inspire you to lead an ethical business, thrive in a competitive market, and succeed as an entrepreneur. We’re committed to creating an environment that fosters academic curiosity and intellectual growth. With over half a million books, a diverse range of online and digital resources, and a rich special collections archive focused on Arizona and the Colorado Plateau, Northern Arizona University’s Cline Library will help you explore the topics that engage and excite you. Our research enterprise is a critical aspect of our investment in academics that go further. Our faculty, staff, and students undertake groundbreaking projects in STEM, social science, and humanities fields, supported by a vibrant ecosystem of centers and institutes.